A large family composed of a mother and 4 children moves to Milan from the rural south to join the remaining son. The adaptation to city living does not happen smoothly and the family structure starts shattering. This is one of the first films in the redefinition of Italian cinema right at the start of the 60s. Italian cinema starts moving away from the neorealism that so dominated it during the 50s, and while there are still elements of this in Rocco, there are great changes that are in my opinion all for the better. Firstly in Rocco all the acting is professional, which is a change I welcome, while the use of non-pros may at times increase the authenticity of the film it often just produced bad acting. Here you get to cherish the performances of some very good actors, with the exception of a couple of characters, such as the hysterical mother. Secondly the film is made on a grand scale, with its almost three hour running time with much more studied editing, camera work and lighting than most neorealist films. 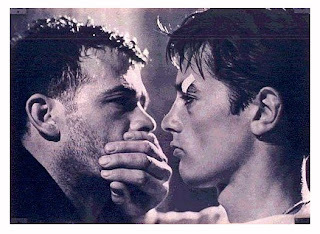 In this way Rocco makes for a decisive improvement in Italian cinema in my opinion, not being the greatest fan of the excesses of neorealism, and it is a truly great piece of cinema. I still have problems with it: the bad dubbing which is a constant of Italian cinema for at least the next 20 years and the histrionics of so many of the characters (although they are Italian after all). But there are so many positives about he beautifully shot and directed film that it is hard to put too much importance on those. The staff at Variety magazine lauded the drama, and wrote, "With all its faults, this is one of the top achievements of the year in Italy...Scripting shows numerous hands at work, yet all is pulled together by Visconti's dynamic and generally tasteful direction. Occasionally, as in the near-final revelation to the family of Simone's crime, the action gets out of hand and comes close to melodrama. Yet the impact of the main story line, aided by the sensitive, expertly guided playing of Alain Delon as Rocco, Annie Girardot as the prostie, and Renato Salvatori as Simone, is great. Katina Paxinou at times is perfect, at others she is allowed to act too theatrically and off-key."